Yesterday the Kirknewton blog exploded with the most views since we started – you obviously wanted to see all your big ideas! Today we start the maps – beginning with land use. You can see more maps at the Meals and Wheels event tomorrow. I have just spent the morning putting the display together. Hope you find it informative. You can subscribe to the blog if you wish (see the panel on your right). One of your BIG ideas has been the redevelopment of the park (and sporting facilities around the village). Work begins on Monday of the new play park (with benches hopefully). Becky Plunkett will be at the Meals and Wheels event asking for your thoughts on further park redevelopments and how you can help achieve that. 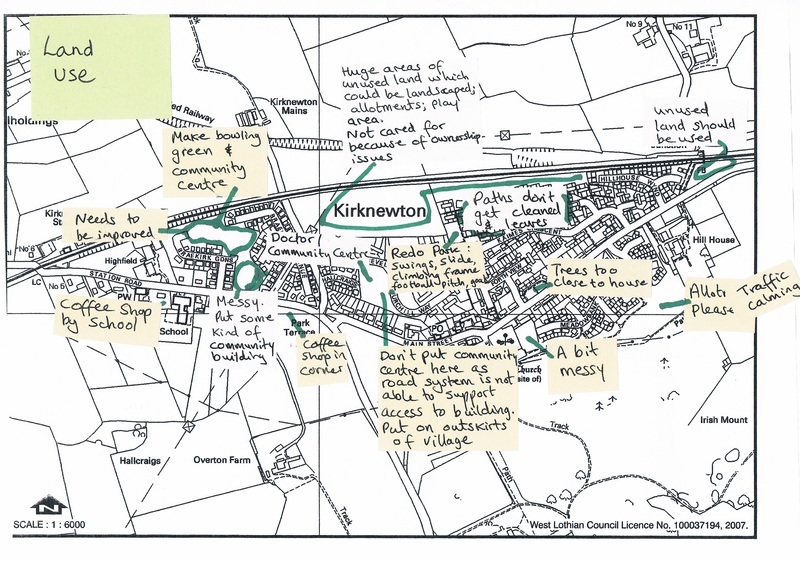 When I was speaking to Becky this week she described your ideas as “Kirknewton – a sports centre without a roof!” – that’s a pretty cool thought for the future, isn’t it?